After playing through a few well-designed tutorials (highly recommended), you can select a game type that appeals most. 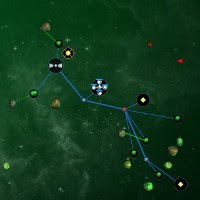 Build mining units to gather resources, construct repair stations that will proactively “heal” damaged units, place turrets to contend with enemy ships, and add “power nodes” to ensure that each unit has enough energy. It sounds like a lot to keep track of, but the game does a great job of acclimating players. Thanks to an intuitive interface, you’ll be focusing entirely on strategy and execution in no time. The graphics and sound are clean and simple, and each unit is easily recognizable. It’s also worth noting that many of the scenarios can take a while to complete. For example, the final campaign mission asks you to build a base and survive for twenty minutes while being bombarded by enemies. If you’ve been looking for a meaty strategy game that’s easy to learn, but hard to master, look no further. Don’t let the title’s simplicity fool you – The Space Game is a deep and balanced title that can easily keep you busy for a long time.